Heading to Wildwood for vacation? 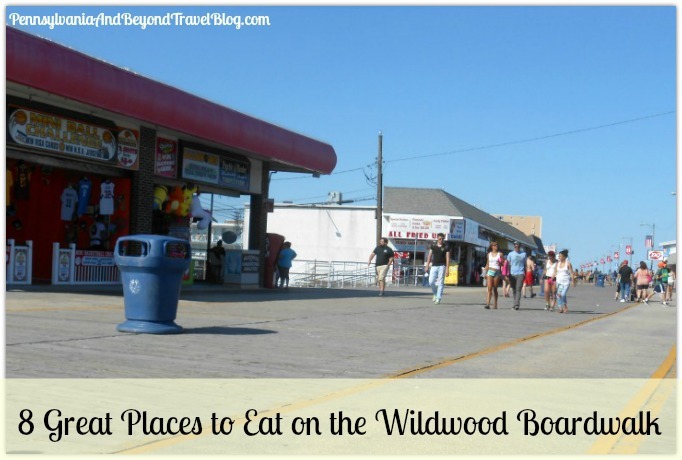 Looking for some great places to eat on the Wildwood boardwalk? If so, we've compiled a little list of some of our favorite places to grab lunch, dinner or a quick snack. All of these restaurants and eateries are located right on the boardwalk! 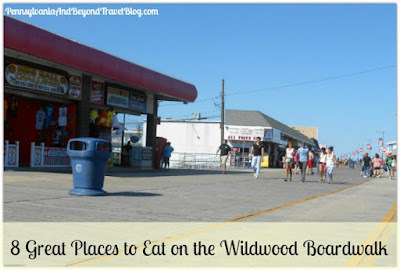 Here are 8 Great Places to Eat on the Wildwood Boardwalk in New Jersey!!! 1. 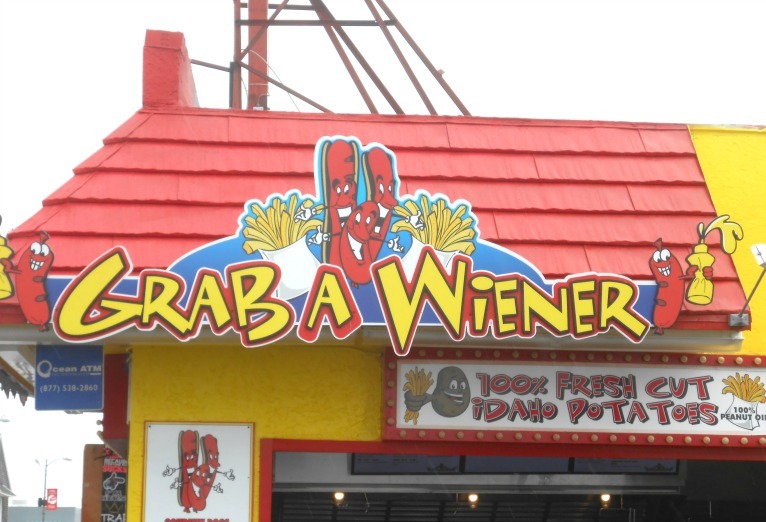 A relatively new place to hit the boardwalk eatery scene is Grab a Wiener and yes...that is their name! They serve all kinds of freshly cooked hot dogs & wieners! If you love freshly cut Idaho potatoes (French fries) you can get those here too. You can eat right there or order take-out and take your goodies along with you. 2. If your craving something more substantial to eat, then Joe's Fish & Chips is the place to eat. Just as the name implies, you can get all kinds of fish dinners, fish sandwiches, chips, french fries, seafood and other typical fare that you find at the Jersey Shore. You can eat there (seating area in the back) or order take-out and take it with you. 3. If you're craving some sugary sweets and looking for some of the best funnel cakes on the boardwalk, you'll want to head to the Sugar Shack for that! 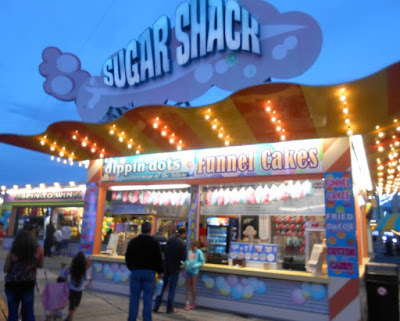 You'll find funnel cakes, cotton candy (variety of flavors), dippin dots, ice cream and more! I like to get their funnel cakes and my daughter goes for the cotton candy, she swears it's the best on the boardwalk. 4. 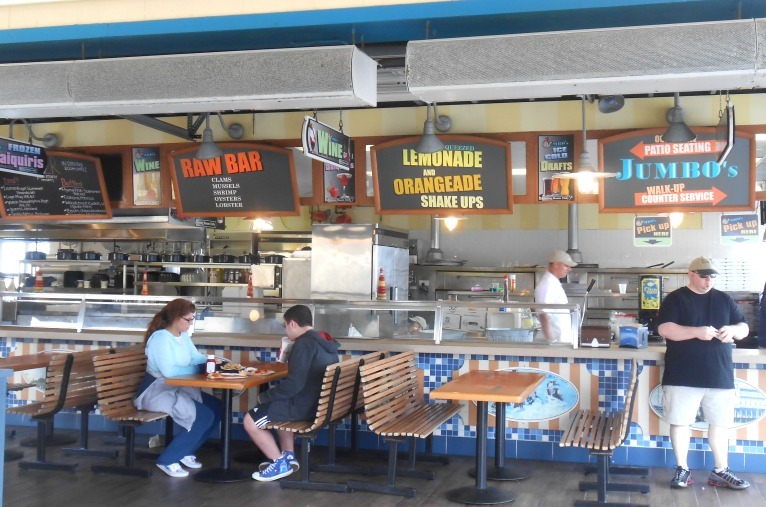 Jumbo's Boardwalk Eats is one of our favorite places to eat right on the boardwalk. Every time we visit the Jersey Shore, we eat at least one time here. You can order all kinds of different fish & seafood, french fries, hamburgers, cheeseburgers and more. If you're looking for fresh-squeezed lemonade, Jumbo's has some of the best! You can eat-in or order take-out to go! 5. 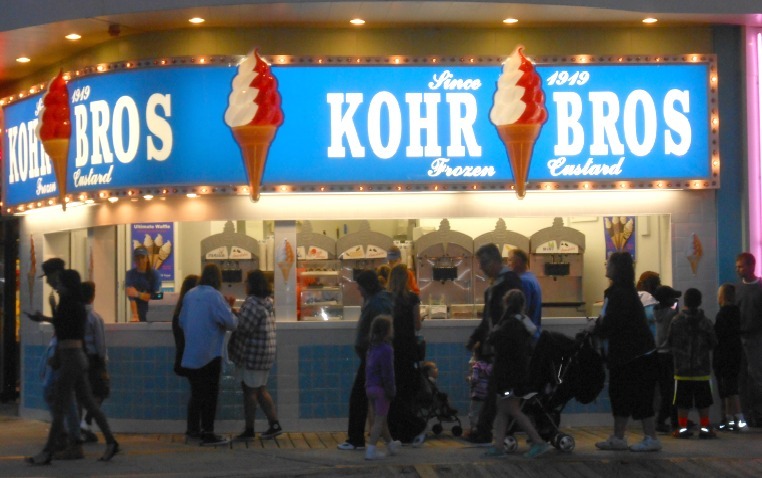 If you're looking for some of the BEST ice cream on the Wildwood boardwalk you'll want to pick up an ice cream cone or dish of ice cream from the famous Kohr Bros who have been in business since 1919. You'll find them at several locations and in our honest opinion, it's the smoothest, creamiest and most delicious ice cream on the boardwalk! Like frozen custard? They have that too! 6. If you're looking for a pizzeria that also offers your classic dinner-style food, you'll want to head to Route 66 Restaurant & Pizzeria on the boardwalk. They offer breakfast, lunch, dinner and late evening snacks. You'll find your classic breakfast, lunch & dinner foods like egg dishes, hamburgers, pizza, french fries, onion rings, salads, hot sandwiches, crab cake sandwiches, paninis, freshly-made wraps, platters, hoagies, spaghetti dinners and other yummy items that they serve. You can dine-in or order take-out to go! 7. 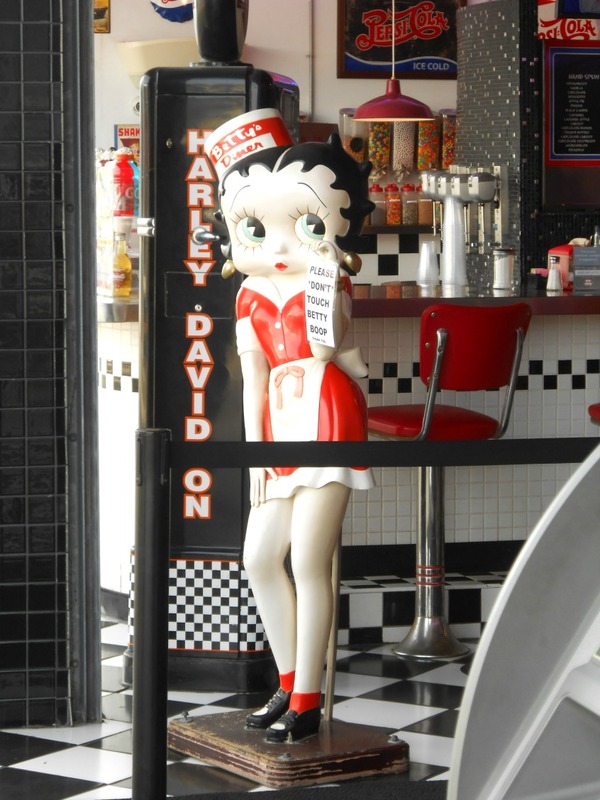 If you're hungry for your classic diner fare, you'll want to check out the Doo Wop Diner located right on the Wildwood boardwalk. They offer hamburgers, cheeseburgers, chicken, french fries, onion rings and more! This diner is a lot of fun because it's decorated in your classic 1950's Doo Wop style! They claim to be the best burger joint in the area and I have to admit, they are pretty good! 8. When we want the absolute BEST French Fries that you can find in this area, we head to Curley Fries! You can buy their hand-cut fries in a variety of different sizes. We always get the large-sized family bucket to enjoy. Every time we visit the island, we get French Fries here at least twice during our stay. 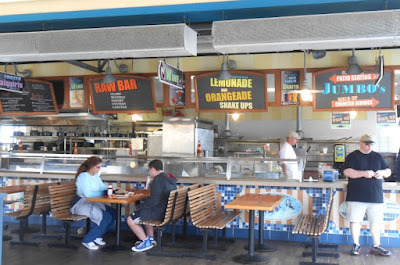 In addition to having the best french fries, they also have the absolute VERY BEST fresh-squeeze lemonade that you can find on the entire boardwalk! Hands down, the best! Well, there you have it! 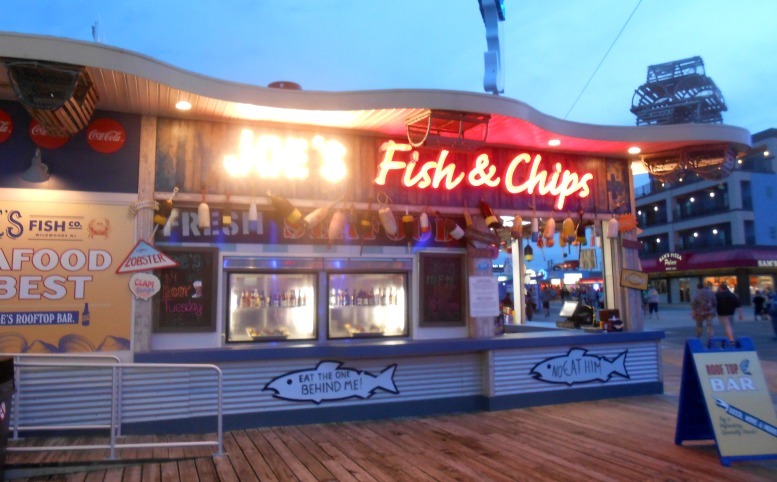 Our favorite 8 places to grab something to eat on the Wildwood Boardwalk in New Jersey. Do you have any favorite places? I can't decide which place would be my favorite. 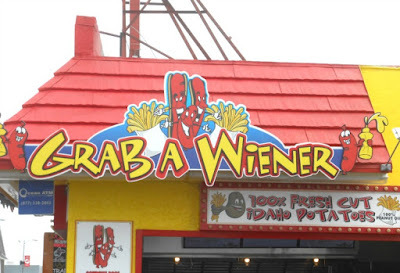 Grab a wiener sounds different, but I love all kinds of fish and chips. Of course I have to have my sweets too, swo I would visit Kohr Bros.